It was a concession, right? Among several relatively minor changes announced Wednesday, Forest City Ratner agreed to lower the announced 620-foot Miss Brooklyn tower a sliver below that of the iconic 512-foot Williamsburgh Savings Bank nearby. Yes, it met the request of Borough President Marty Markowitz, who in his August 23 oral testimony on the Atlantic Yards plan had called for the bank to remain the borough's tallest building. But many residents also asked that architect Frank Gehry's self-described "ego trip" not block the bank's signature clock tower. To achieve that, the developer would have had to make a much greater sacrifice: make the tower even smaller and/or move its footprint. Indeed, Jasper Goldman, who studied the plan for the Municipal Art Society (MAS), confirmed to me: "The Williamsburgh Savings Bank is blocked by Miss Brooklyn from Grand Army Plaza because of its location, not its height. 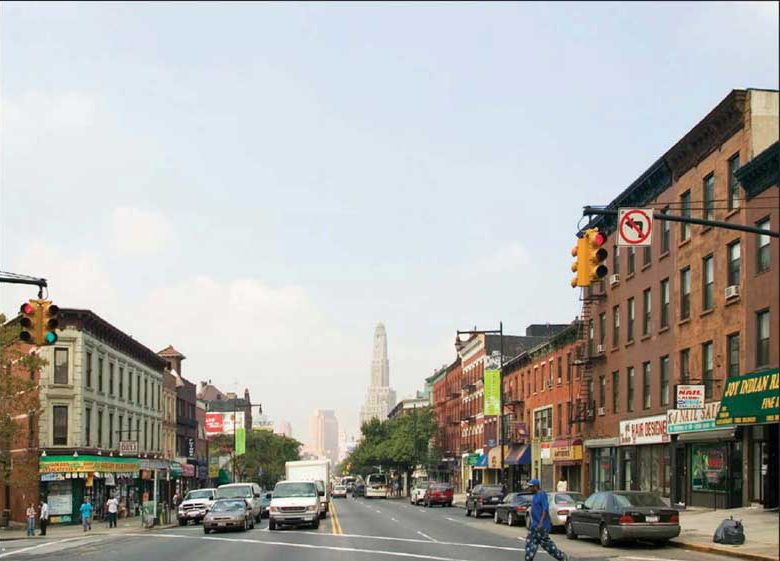 To retain this view corridor, the developer would need to move Miss Brooklyn to the east." And moving Miss Brooklyn, apparently, was not on the table, even though Forest City Ratner in its initial project announcement on 12/10/03, promised to do just that: The northernmost building on the site, an office building, will be set back slightly from the intersection of Atlantic and Flatbush Avenues, to maintain the view corridor to the Williamsburg Bank building. The City Planning Commission did ask for the building to be narrower in places. But the city explicitly endorsed a 620-foot tower. Said Regina Myer, then director of the Department of City Planning's Brooklyn office in September, “We really do believe the height it’s proposed at is really appropriate." I wrote: Really? Or does that leave Miss Brooklyn for a negotiated trim at a later date? Markowitz didn't ask that the clock not be blocked. MAS and others, including City Council Member Letitia James, did so. The FEIS [Final Environmental Impact Statement] should acknowledge that in becoming a new visual element and wayfinder, Building 1 may diminish views of the Williamsburg Bank Building from many locations. Moreover, Building 1 should not be taller than 512 feet. Officials say that Forest City has not settled on the final numbers for the project, but that it plans to reduce the size by 500,000 to 700,000 square feet by eliminating hundreds of market-rate apartments. That would enable the developer to cut the height of some of the towers, including a 350-foot building on what is known as Site 5, on the west side of Flatbush Avenue, and possibly at Miss Brooklyn. But according to executives briefed by the developer, Mr. Gehry has objected to any changes in his design for Miss Brooklyn. That sounded a bit fishy then and even fishier now. Was Gehry truly throwing an artistic fit? After all, the architect doesn't call the shots. Last January, Gehry had expressed interest in meeting with Brooklynites who live near the site footprint, but said he had to get clearance from his client. He never did. But by blaming the resistance on a temperamental architect--a quote sourced ultimately to his client--Forest City Ratner could buy time and make it seem like the final scaleback was a true concession. So the City Planning Commission and the ESDC provided crucial cover, loyally backing the decision not to trim the height of Miss Brooklyn. So, apparently, did Markowitz. Given the ESDC's slap at the Borough President's request to maintain the bank as the borough's tallest building, you'd think the Borough President might have complained publicly. How significant is the change? Well, we don't know, in square footage, the dimensions of the reduction. But consider that Miss Brooklyn was planned until recently to be three times the bulk of the bank building. Even some 110 feet shorter, Gehry's tower undoubtedly would be well more than double the size of the bank. Because the size of the tower has been understood by many as the impediment to the view of the bank, some people must think that Forest City's announcement Wednesday meant that the clock wouldn't be blocked. I could not be more disappointed with the vote in favor of the Atlantic Yards proposal in return for some concessions that the developer has neither the authority nor the means to effectuate. 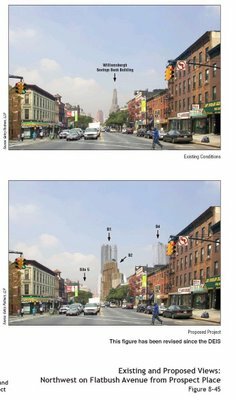 While I am pleased that the Williamsburg Bank tower will remain visible to Brooklynites, the proposal’s serious failures do as well. This proposal should have gone back to the drawing board. Well, the bank tower may wind up somewhat more visible near a 511-foot Gehry tower than a 620-foot version. However, the fundamental change--moving Miss Brooklyn to maintain the view corridor--was not on the table.